Earnings of discount retailer Dollar General (DG) climbed 76.5% in the final quarter of 2017, helped by the benefit from the tax reform. 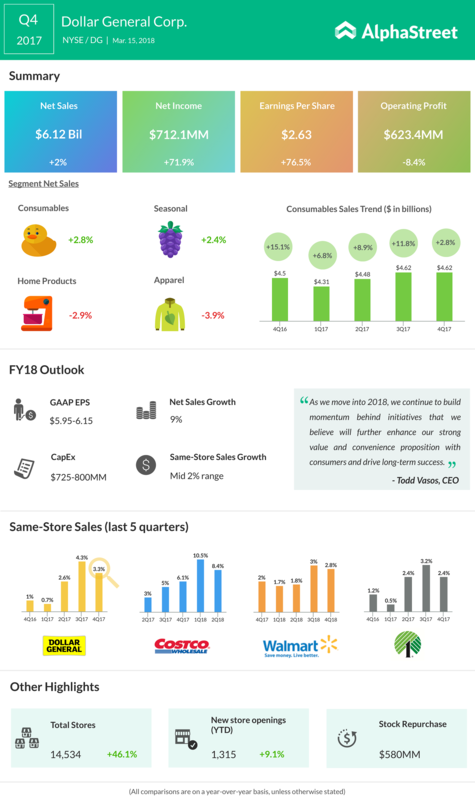 Same-store sales grew 3.3% year-over-year, boosted by strong results in the consumables and seasonal products. Higher average transaction aided the same-store sales growth and offset the slight fall in customer traffic. Despite earnings and revenue coming in below Street expectations, the company issued the fiscal year 2018 guidance above the consensus. Following the news, Dollar General stock showed an upward momentum and was up 4.7% when markets closed. Profit jumped 76.5% to $2.63 per share, while sales rose 2% as the positive impact from the sales in new stores modestly offset the sales from closed stores. The company incurred $28.3 million in costs from the closure of incremental 35 stores in the form of selling, general and administrative expenses. Adjusted EPS of $1.48 was in line with market expectations. The company’s board of directors lifted its quarterly cash dividend by 12% to $0.29 per share. The board also lifted the authorization under the share repurchase program by $1 billion. At the end of fiscal 2017, the total buyback authorization remained at about $354 million. Looking ahead into fiscal 2018, Dollar General guided earnings in the range of $5.95 to $6.15 per share and net sales growth of about 9%. The outlook for same-store sales growth is in the mid-2% range. The company, which sees $300 million cash benefit, predicted share buyback to be about $850 million and capital expenditures in the range of $725 million to $800 million. The discount store chain, which opened 1,315 new stores, and renovated or shifted 764 stores during fiscal 2017, intends to open about 900 new stores, renovate 1,000 stores and shift 100 stores in fiscal 2018. Over the longer term, Dollar General’s goal is to grow non-GAAP EPS at a rate of 10% or higher. Dollar Tree (DLTR), the rival of Dollar General, reported results last week that were below Street expectations, albeit the tax benefit. Adding to the investors’ woes, Dollar Tree’s fiscal 2018 earnings guidance was also below market forecast. Following the disappointing results, Dollar Tree stock plummeted 14.48% on the earnings announcement date.